Wallstreetwear.com mission statement reads something like this "designed to be a faster, easier and more cost effective selling and trading environment than any other service available today. It is the world's first streetwear marketplace, enabling users to network, buy, sell and trade anything encompassing this niche youth culture." The site is currently in its private invitation only testing period. I was one of the lucky few provided an invitation to participate in the early stage of feedback and testing. 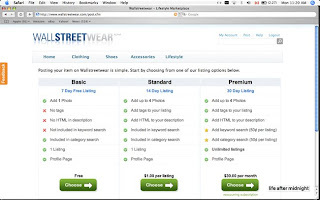 The site will rival the SoleCollector.com marketplace forum and competitors like eBay, Amazon and Kijiji. The site was founded by Rudy Sigua, Rick Cagadoc and Brandon Murio who have made San Francisco home base for the project. The site is clean and easy to navigate through, the listings have no headings which is a nice feature and simply sort by brand. Like Kijiji you have a tier listings system to chose from. The Basic, Standard and Premium. 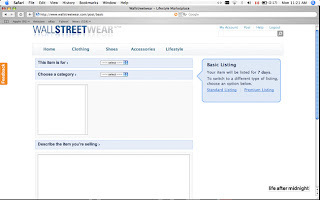 Basic Listings are currently free (which may change) and allows the listing essentials. Standard allows for 4 pictures, keywords and tags to be applied to the listing and will run you about a dollar. Premium listings allow for 4 pictures and unlimited listings. I would imagine a majority of users will use basic as it is free and has essentially everything you would need unless this again chances when opened to the general public. 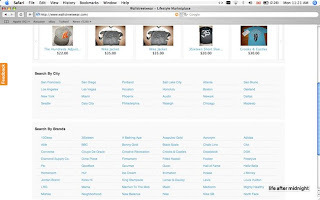 The site allows you to chose a dollar amount for the item and the bid format is removed. In my opinion this eliminates the headaches of eBay and the sale percentage fees. My favourite component is the featured 'Trade' offer button on the listing. They recommend PayPal as payment method, which makes sense, but you have to factor in the PayPal will take 4% of the purchase price. Overall the site works well. Still a little while before it opens to the general public and we will get a better idea of how everything works. This is just a hunch but I would go out on a limb and say that these guys will sell the site to eBay over the course of the next couple years. I don't see it being an extremely profitable site for them unless they develop their own payment system or develop mandatory listing fees (unless I am missing something). But the time and effort invested into the interface is sure to get eBays attention. eBay currently owns and operates just about every useful online site including Kijiji, PayPal, Skype, Shopping.com, Craig's List and StubHub. Look for them to acquire Wallstreetwear.com in the near future.